Read on for our list of recommended Cartagena Shore excursions. 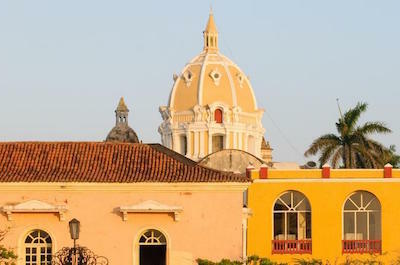 Step off your cruise ship and join a small group tour of Cartagena. It is the most relaxing way to discover this fascinating city. See the main Unesco Heritage sights and learn all about its vivid history. The shore excursions take you to the famous Castle, the quaint shopping district, the Old Town, a Church of a famous Saint, a mangrove forest, an Emerald Museum and more! Choose one that best suits the time limits and interests of your group. The perfect tour for history buffs who want to get a taste of the grisly slave-filled history of the city! The tour departs from the Cruise Port and takes about 8 hours. You will travel with a personal knowledgeable guide and learn all about this Unesco World Heritage city on a fabulous Cartagena shore excursion. Set off to the imposing Castillo San Felipe, a famous site where several battles between the Spanish, English and French took place. It is located on a hilltop overlooking the city and also offers spectacular views of the Caribbean Sea. Then visit the beautiful San Pedro Claver Church, home to the famous priest who aided sick slaves arriving in the port of Cartagena. This venue holds great sentimental value among Colombia's African-American descendants. Your guide will tell you how the heroic San Pedro Claver saved over 300,000 slaves. Now for the brave! Visit the Inquisition Museum and explore the bloody past of the trials and tribulations of the inquisitions that took place in the 17th century. Then, relax and catch your breath in the lovely Las Bovédas district, known for its craft stores and art galleries. Browse the quaint boutiques and enjoy a cup of coffee before heading back to the cruise port. Disembark from your luxury cruise ship and enjoy a 3 to 4 hour walking Cartagena shore excursion to learn more about this fairytale city of romance, legends and beauty. Your local and knowledgeable guide will meet you at the Port. Set off on a fabulous and relaxed walk where you will be enchanted by local sights and stories. Head to the Fort of San Felipe de Barajas, the highest point in the city located on the Hill of San Lázaro. This imposing castle, which dominates the skyline, was built in the 17th century to control sea and land access. Then continue to the Historic Old Town, a Unesco World Heritage site which delights with a maze of cobbled alleys and balconies smothered in colorful bougainvillea. Stroll around and visit places of interest that include famous streets, squares, parks, monuments, museums and churches. Stop for a coffee at a local café and do some people watching. Your guide will thrill you with stories of pirates and legends. You will have time to explore the quaint shops to buy a special souvenir to take home. The walking tour then returns to the Port. The next fabulous thing to do in Cartagena is to join a Mangroves Tour, Cartagena shore excursion. The region around the city offers one of the most diverse and rich flora and fauna eco-systems that will delight nature movers. Meet your guide and set off to the famous San Felipe de Barajas fortress to see panoramic vistas over the city and Caribbean Sea. 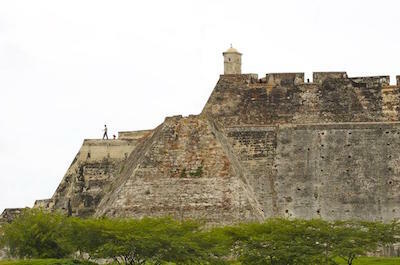 This fort is considered one of the most important Spanish military engineering feats of the new world and is located on the Hill of San Lázaro, towering above the city walls. Then, head for the water and get comfortable in a canoe. 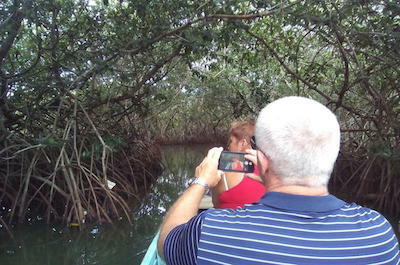 After a quick lesson in paddling, you will follow your guide through the exotic mangrove swamps on a relaxed tour. See the beauty of this natural landscape. It is home to a large variety of tropical birds, stunning colorful fish and crustaceans. Your knowledgeable guide will update you with information as you sail along. Make sure you have a camera handy to snap some unforgettable photos! After the canoe trip, you will take a stroll through the Historic Old Town to discover the colorful mansions, flower filled balconies, streets and squares that make Cartagena a Unesco World Heritage Site. The trip returns to the Port after a fabulous 4 hours of fun and discovery. Combining sight seeing and shopping makes our next recommended Cartagena Shore excursion a winner! This tour is ideal for first time visitors, photographers and tourists who want to experience as much as possible in a short time of about 3 hours. After leaving your cruise ship, meet your personal guide and get comfortable in an air-conditioned minivan. Your trip sets off to Manga Island, a neighborhood known for its stunning architecture. Then visit the imposing San Felipe de Barajas Fortress, towering on top of the Hill of San Lázaro. It offers an amazing insight into the history of the region as well as panoramic views. The tour proceeds to see the Unesco World Heritage Old Town where you will explore the quaint cobble stone streets filled with overhanging balconies of colorful bougainvillea. Stroll around the picturesque plazas, see the grand palaces and mansions built in classical colonial style. You will then have time to shop up a storm, be sure to buy some handcrafts and a souvenir to take home. The tour returns you to the Port. 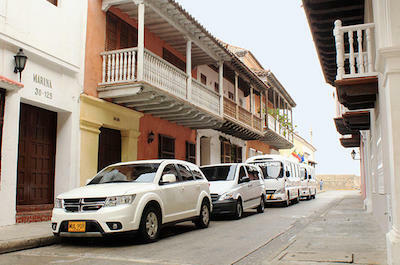 Get immersed in the fascinating history of Columbia in this 5 hour walking Cartagena City Tour. Your Cartagena shore excursion starts at the Cruise Port where you will meet your knowledgeable local guide. Set off and head for the imposing San Felipe de Barajas Fortress, towering on the skyline on top of the Hill of San Lázaro. It was built in the 17th century to protect the city from land and sea attacks. Your guide will update you with all the interesting facts of American battles that took place here. From the fortress you have panoramic views over the city and the Caribbean Sea. Make sure you snap some photos! Then set off to the San Pedro Claver Museum and Cloisters. This inspiring museum is dedicated to the Patron Saint of Slaves, who helped save the lives of thousands of slaves. Next you will explore Las Bovedas, the barracks, which were built as dungeons but also used to store arms and ammunition. Today they host a Cultural Center of local art, Caribbean traditions, boutiques and gift shops. Then it is off to stroll around the Unesco World Heritage Old Town, filled with picturesque cobble stones streets, beautiful colonial architecture and quaint shops. The walk ends with a visit to the Zenu Gold Museum, a charming colonial house on the Plaza Bolivar. Here, you will see pre-Colombian art, the world famous art of the natives who lived in Cartagena in ancient times. If you want to get an in-depth feel for the amazing history of Columbia, this 6 hour Cartagena shore excursion is a must. 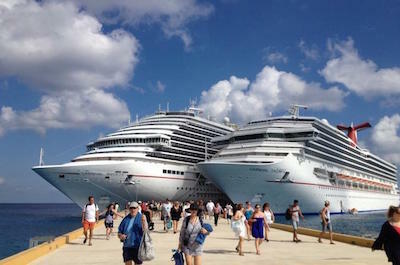 Join your guide at the Port after your cruise ships docks. You will set off to explore the vibrant and historically important city, brimming with colonial architecture, stories of Spanish conquerors and a rich culture. Learn all about the history starting in 4000BC up to the current time. Visit the historic center of Cartagena and see the famous clock tower, Torre del Reloj. Then stop at the Plaza de la Aduana, where slaves were traded in an open market hundreds of years ago. Next is an awe-inspiring visit to the Cathedral of Cartagena followed by a visit to the Plaza de Bolivar, home to the Gold Museum and the Theater of Heredia. 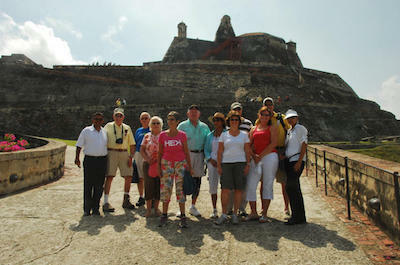 Next, head to the hilltop of San Lázaro and explore the Castillo San Felipe. This fortress was built by the Spaniards in the 17th century. 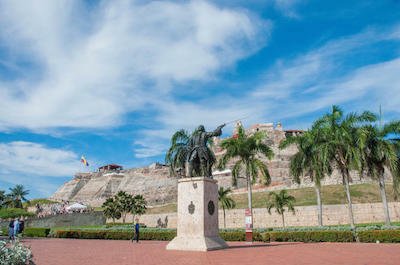 From its imposing ramparts you will have spectacular views of Cartagena and the Caribbean Sea. Your trip ends in Las Bovédas, a district known for craft stores and art galleries. Relax over a cup of coffee, spend time browsing the local shops and then head back to the Port. The first thing to do when disembarking from your cruise ship is to join a small group tour to explore the amazing sights of Cartagena. This Cartagena shore excursion is a walking tour led by a local guide and takes about 4 hours. Set off to the Manga neighborhood to view the stunning Moorish and Colonial architecture. Then head to the high hill top of San Lázaro to explore and learn about the imposing San Felipe de Barajas Fortress towering on the skyline. Next is a shopping spree! Walk around the lovely Las Bovedas district and visit the quaint stores to buy some special souvenirs. Then stroll around the famous Old City, an historic center filled with winding cobblestone streets, overhanging flower filled balconies and magnificent colonial-style homes. Stop at the Saint Peter Claver Church and Museum and learn about the iconic priest who saved the lives of thousands of slaves. The final stop is the Emerald Museum. Learn all about this stunning semi-precious stone from a professional guide and learn how to recognize an original Colombian Emerald. If you really want to splash out, buy someone special a magnificent emerald as a gift! Your trip ends back at the Port. As a first time visitor, joining a Cartagena shore excursion is the best way to learn all about this fascinating city and see the main sights in a short time. This Cartagena shore excursion takes about 4 hours. Meet your personal guide at the Port and get comfortable in a luxury car or minivan. Set off to the Manga neighborhood to see stunning Moorish and Republican homes. Next is a visit to the imposing San Felipe Fortress, set high on a hilltop overlooking the city. Learn about how it was built to protect the city from attacks and see the panoramic vista over the Caribbean Sea. Now, relax and do some shopping and browsing in the quaint stores of Las Bovedas before heading to the historic Old City for a walking tour. Stop at Saint Peter Claver Church and Museum and then enjoy a sightseeing tour around the modern side of the city where you will see the Bay of Cartagena. The final stop is the awe-inspiring Emerald Museum. Take a guided tour led by an emerald professional guide and learn how to recognize an original Colombian Emerald. The perfect place to buy a sentimental gift for a loved one! The tour ends back at the Cruise Port.